You’ve taken the job of connecting with the right people online seriously. You’ve methodically built your professional network of connections on LinkedIn. You’ve added your family, friends, old classmates and co-workers to your list of Facebook friends. This is a wonderful way to stay in touch by keeping up with status updates and photos, but what if you want to send a private email to one of your connections? Unless you happen to know their email address, you have to go to LinkedIn or Facebook to send that email. Would you like to have access to the email addresses of your friends and connections outside of Facebook and LinkedIn? Would you like to add them to your own contact list in Outlook, Gmail, Yahoo or wherever else you stash this information? If so, you’re going to be very happy because you’re about to find out how to do just that. Downtime – All websites, including Facebook and LinkedIn, go down from time to time. During these times, you will not have access to this information. Access Denied – There are many instances of people getting locked out of their accounts for a variety of reasons. Many ended up regaining access, but how frustrating it would be to lose all of that information! 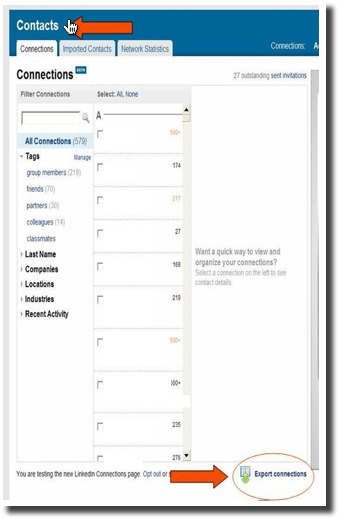 Fortunately, LinkedIn allows contact information for your connections to be exported directly from the site. I recommend doing this on a regular basis, depending on how frequently you usually add new connections. All of the how-to information about exporting your LinkedIn connections can be found here. You’ll need a Yahoo email account. If you don’t already have one, it is very easy to set up one up. Watch in amazement as Yahoo goes to work, busily importing all of the email addresses from your Facebook friends. When the process is complete, Yahoo will tell you how many new contacts were imported. Chances are this will not be equal to the number of friends you have on Facebook. Don’t worry; there’s no need to panic. It is very likely that not all of your friends have included an email address on their Facebook profile. From here, you will be able to export the list from Yahoo and then import it into any other email program. Rejoice. Do a little happy dance. You now have your friends’ email addresses tucked away in a safe place. If you enjoyed this post, sign up to receive free updates by email here to be sure you don’t miss any future AlmostSavvy news. You are also invited to connect with others interested in social media on the friendly folks on the AlmostSavvy page on Facebook where we share news and tips. Great information, Irene! Thank you. I already have a Yahoo email so this should be quick and easy enough. Great, Mary! It takes a few steps, but is definitely worth taking a few minutes to do. I might just add after step 6 to do the duplicate sweep (for those who already have a Yahoo account)… It’s in BETA for Yahoo but worth doing. When pulling back into gmail or other, there will surely be a bit more duplications to sort out… Lovely and clear steps. Thanks Irene. Excellent point, Minter. Checking for duplicates is very helpful as we often have more than one email address for our friends or we’re got them listed in more than one place.